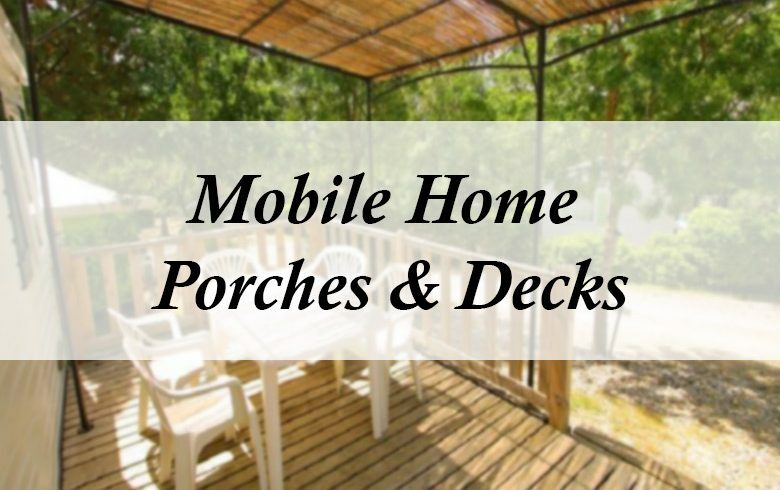 Whether you’re looking to add functional living space, curb appeal or a place to just lounge and relax, a mobile home porch can make for a great additional feature. 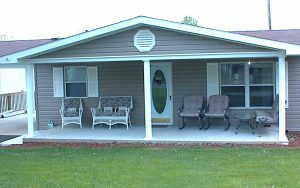 These types of porches are typically built at the front of a mobile home, covered and are usually built using wood boards and a cinder block base. 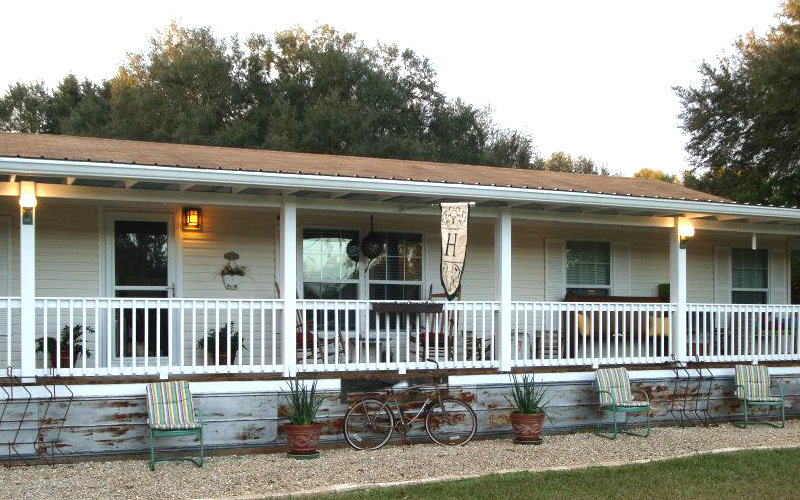 When it comes to mobile home porches, the design potential is truly endless. 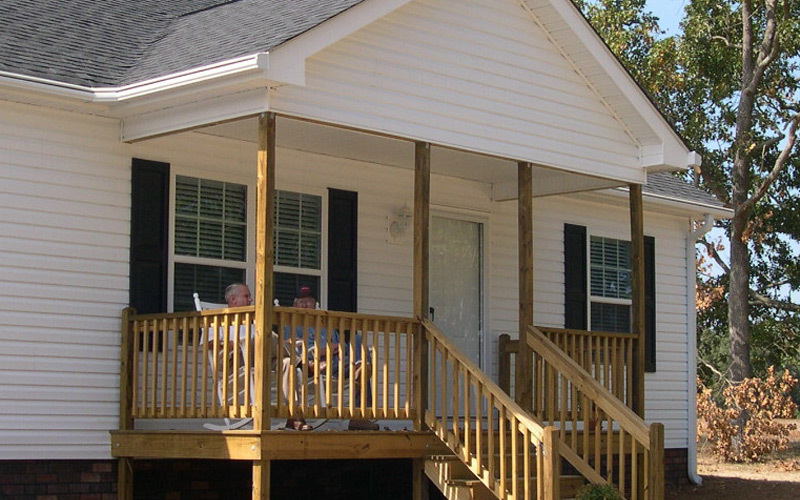 Porches can be built to incorporate ramps for elderly or handicapped residents. Perhaps you want one built with pillars, railings, and ceilings for a more elegant look? 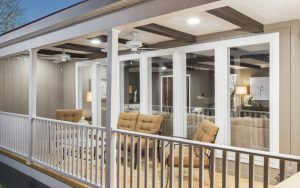 Or porches can be built to be screened in so that they can double as functional living space in addition to the mobile home itself. 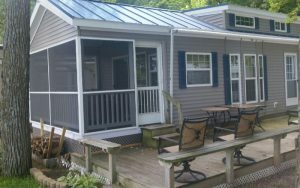 This post will take a closer look at mobile home porches, how they differ from mobile home decks, porch design ideas and how to build one yourself. 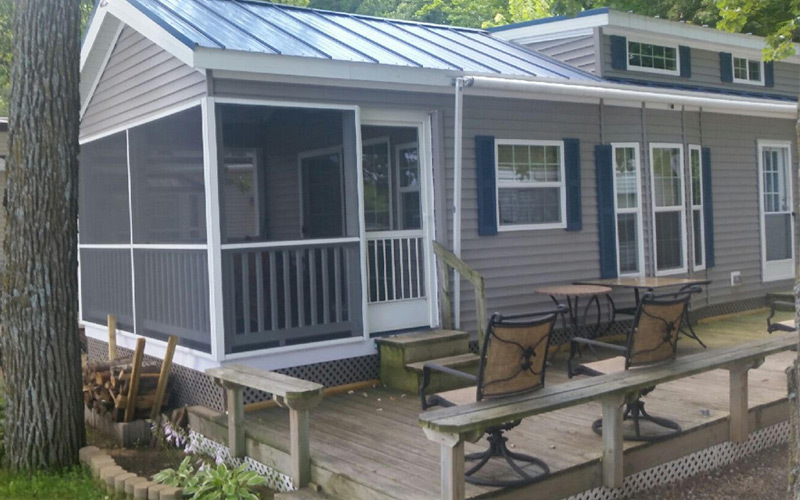 The main difference between a porch and deck in a conventional setting also rings true when it comes to a mobile home application – porches are covered (or even enclosed), where decks are not. Decks, or patios, may also be installed at either the front or the back of a mobile home, where porches are almost always built at the front of the home. Despite these key differences, there are many similarities between porches and decks when it comes to how they are constructed, which you can learn more about later in this piece. 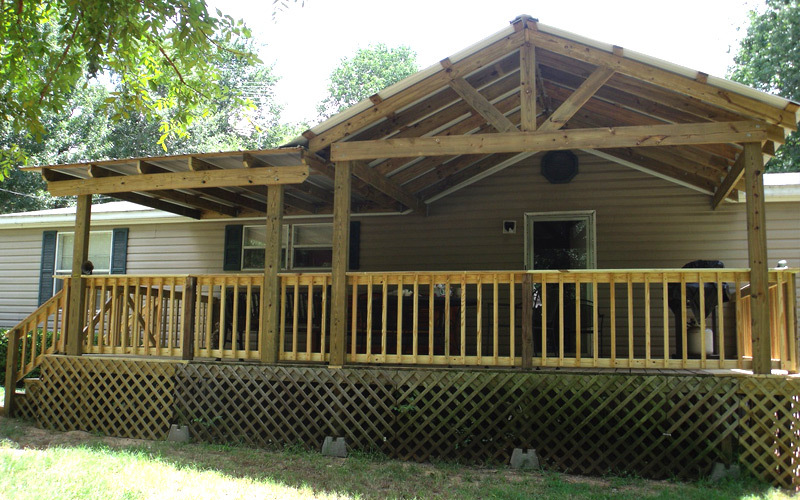 Essentially, you first have to build a deck when you’re building a porch – more on this later. 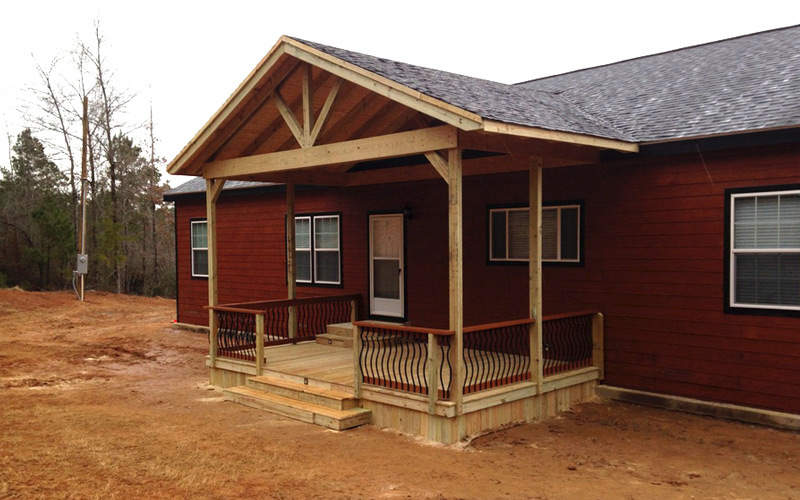 Wood: Wood is the most popular building material used when it comes to mobile home porches, both when it comes to framing and aesthetic features. Wooden posts are typically used for support beams and to frame the porch, and wooden planks are typically used for the flooring on the deck as well as the ceiling. Wood rails may also be used. Wood is a popular material, as it’s affordable and can be stained to meet any sort of aesthetic look. Cinder blocks: Any porch will need some sort of a base to be constructed on. With many mobile homes, this support infrastructure is usually cinder blocks. Cinder blocks are strong, affordable and provide an adequate base to support the deck part of the porch. Roof materials: Depending on the type of porch you’re building and the mobile home you have, the roof may either be adjoined to the mobile home or separate from it. Either way, you’re going to need some sort of roofing material on top of it, just as you would for your main mobile home unit. Rubber roofing, metal roofing, and standard asphalt shingles are all viable options for roof materials for the porch. Skirting: On raised porches, porch skirting is often sought, as mobile home owners don’t want animals nesting or getting underneath the porch itself. Skirting also offers ventilation and improves curb appeal. While wood is a viable option for skirting, vinyl, brick, stone, and metal are other good options as well. 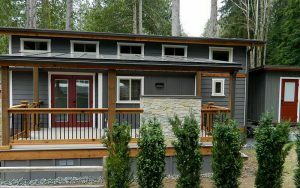 Other materials: Depending on the type of porch you’re building, other materials may be necessary. 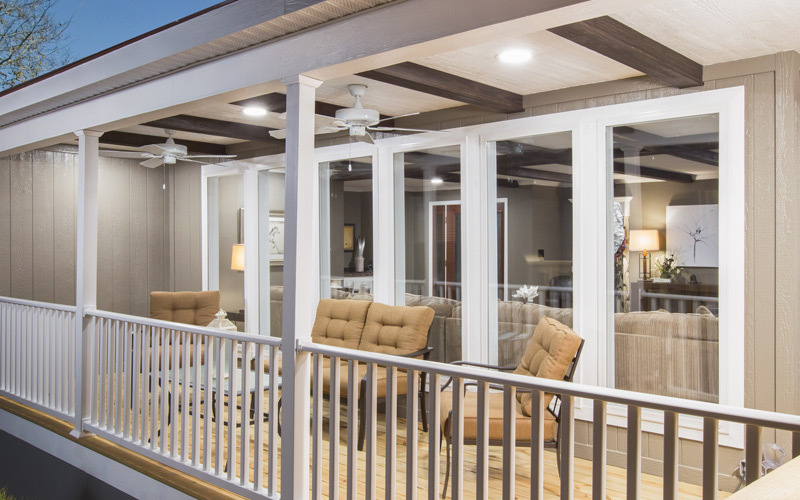 For example, if you’re aiming for a screened in porch, you’ll need to accommodate screens and windows in the design. In terms of tools, a miter saw, deck joists and galvanized screws are just a few of the tools that are necessary for porch construction. 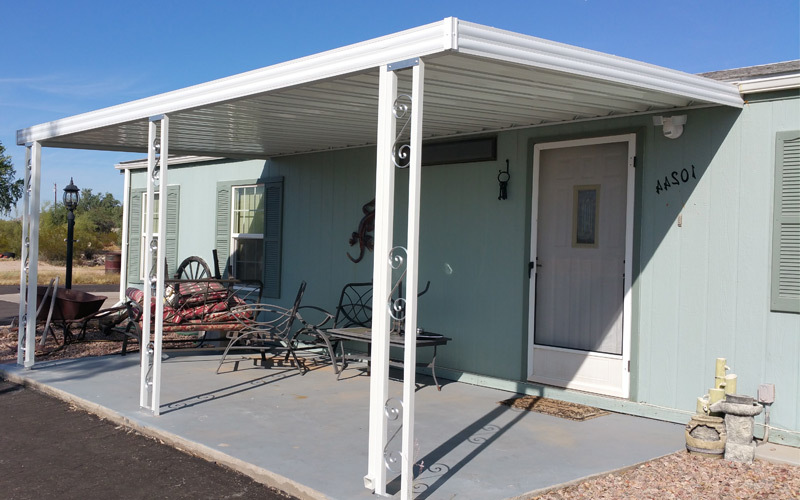 Depending on the type of porch you build and the location of your mobile home, gutters may also be necessary to safely disperse rainwater runoff. 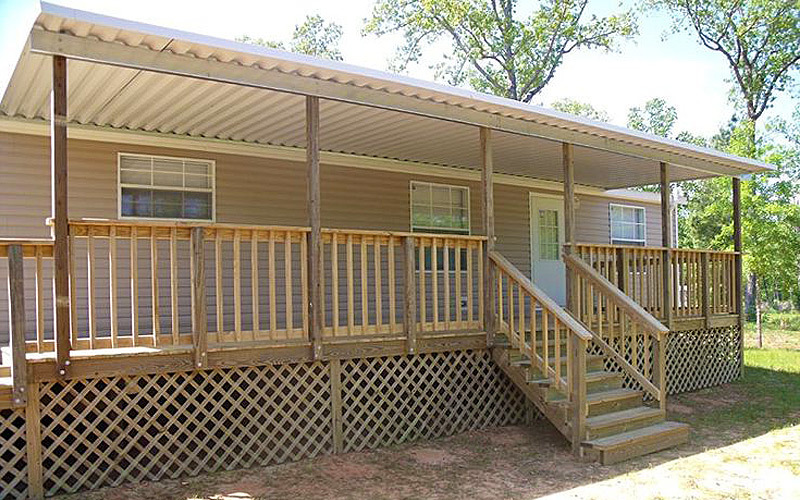 If your mobile home has a flat roof, then a flat roof porch would likely be the best option for you. 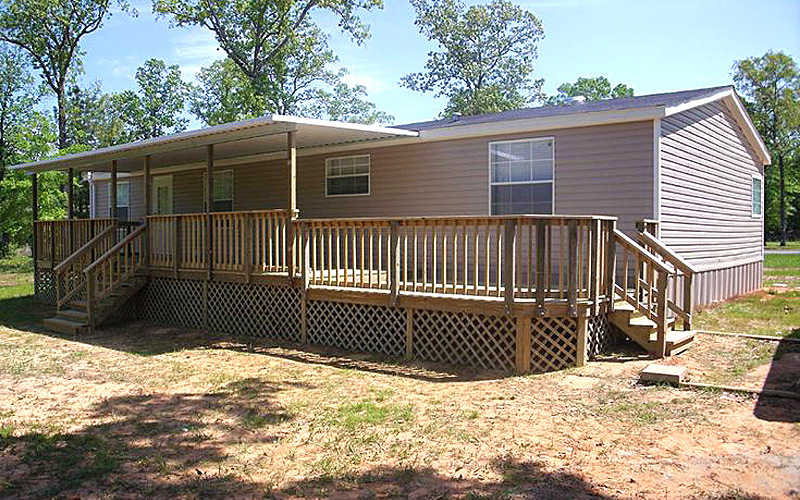 Flat roof porches are also ideal for mobile home units that don’t have extensive roof clearances. Another type of porch design is one that includes a gable roof porch and an adjacent deck. 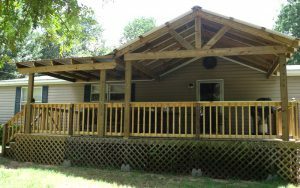 The deck portion would likely extend right off the porch itself. 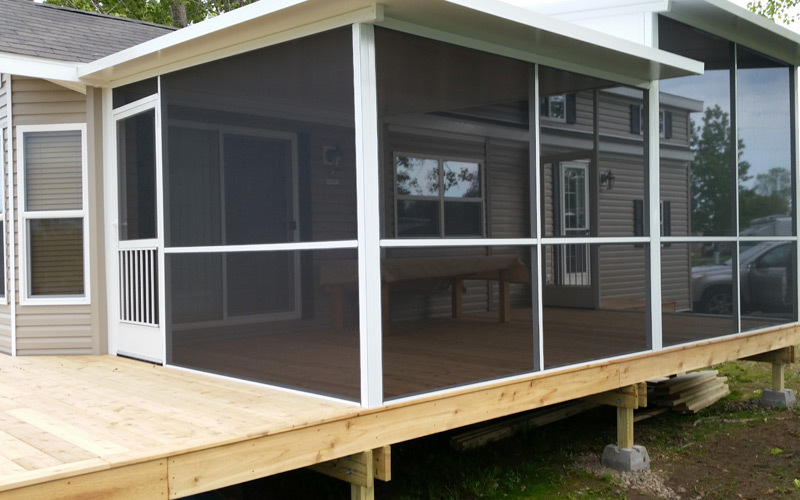 For those that want to extend the available living space of their mobile homes, a screened in porch is likely the answer. What’s nice about screened in porches is that such screens can also be added to an existing porch. 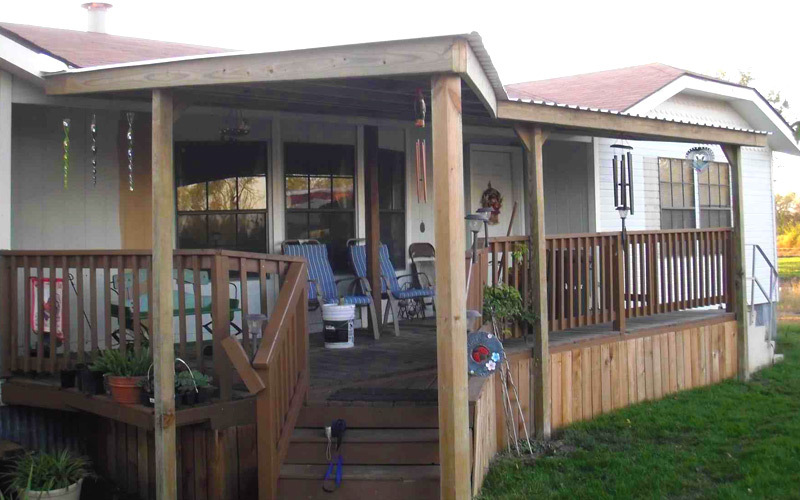 If your mobile home is placed on a larger lot, a freestanding porch could be an attractive option. Freestanding porches are either a flat roof or gable roof porches that simply exist within the lot. In other words, they aren’t built adjacent to the mobile home. There are a couple of important notables that must be considered when it comes to the construction of a mobile home porch. For starters, porches are best built on mobile homes where the owner doesn’t have any intention of transporting the mobile unit elsewhere. 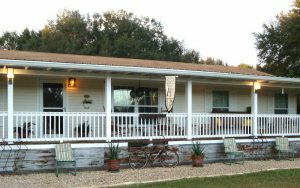 Because porches are built externally to the mobile home, moving the mobile home becomes a much more complicated endeavor when a porch is included. 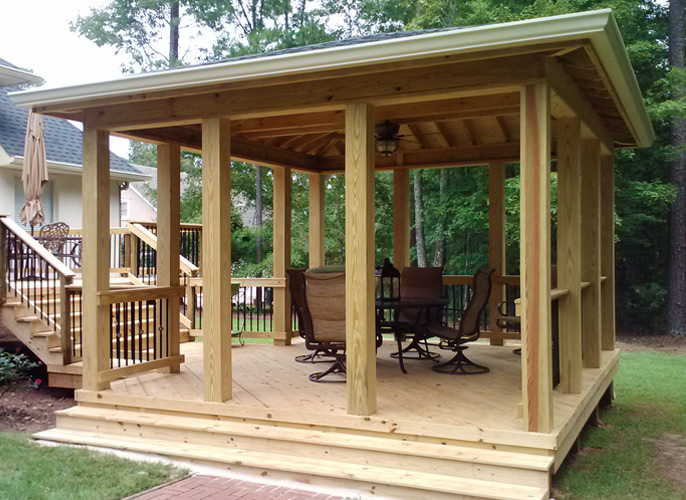 Another important consideration is when it comes to the porch construction itself, specifically the support base. Though cinder blocks – one of the most common base materials – do an adequate job when it comes to providing a base, it’s crucial that this base is level and is able to stay level. Failure to construct a level base is going to directly result in an off-balance porch, either now or in the future. 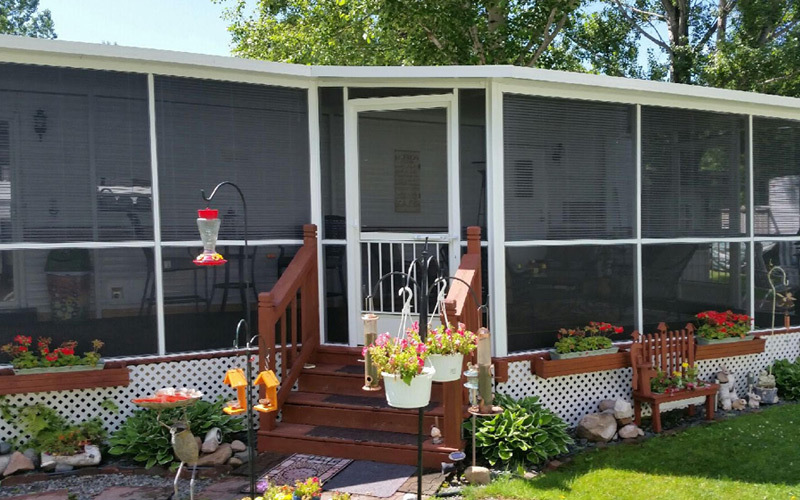 Can A Mobile Home Porch Be a DIY Project? 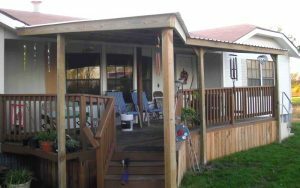 If you’re handy around the house, good with tools and know the basics of woodworking, then building a mobile home porch can absolutely become a DIY project. This is even truer if you have past experience with deck building. A handy mobile homeowner with the right tools and materials should be able to build a porch for their unit in a few days. Here’s a rough outline of the DIY steps involved in the process. Note also that your local mobile home service store can help you with any porch project and DIY kits are also often available. Frame it: After you have the design part down, the first thing you should do is frame out the deck on your property. Use galvanized screws to connect the wooden posts and ensure they’re properly aligned. Build the deck: So now that you have the deck frame outlined, it’s time to actually build the deck. This is best done with 6-foot-long deck boards at least 2 inches in width. Start by laying them out across the frame and then hammering them in. Be sure that there’s about a quarter-inch of space between boards. Create the foundation: Now that you’ve got the deck part of the porch built, you’ll need to create a foundation to support it. As we’ve noted throughout this piece, this is best done with cinder blocks. With a leveler in hand, place the cinder blocks in a pattern that can support the deck. This arrangement is typically best done by placing the necessary number of blocks about 6 feet apart from one another. Use the leveler to ensure the foundation is even. Cut the posts: Next, comes the post beams. Measure from the top of the cinder blocks to the base of the door then cut to length. Use adhesive to adhere to the square section of the deck that you built in Steps 1-2. Place the deck: You may need a helper or two for this step, but lift the deck up and place it on the cinder block base that you created in Step 3. If you can, place the posts you cut in Step 4 inside the center holes of the cinder blocks. Frame/construct a roof: Layout and construct a frame for the roof using 4 x 4, 2 x 8 and 2 x 4 pieces of wood. Attach the roof to the support posts: After the roof portion has been constructed, you’ll again need the assistance of a helper or two to lay the roof onto the frame and support posts of the deck. Secure this part to the support posts and frame. Roof it: Finally, you’ll need to cover your porch roof with the right roofing material. As we noted in the earlier sections, standard adhesive shingles, rubber roofing or metal roofing are the most common types. 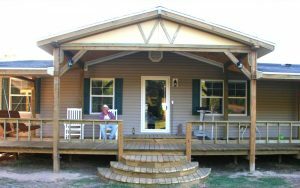 Front Porch Ideas: A resource to help you decide what type of porch would work best on your mobile home, from gable roofed porches to freestanding ones (with picture examples). 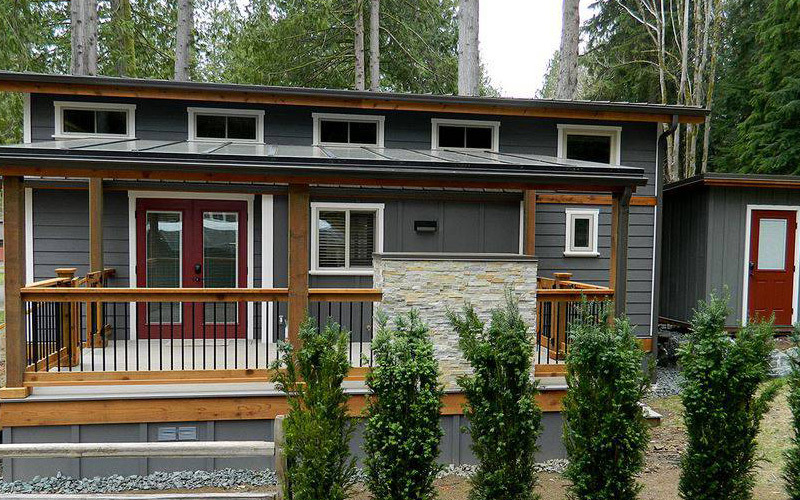 Mobile Home Living: More ideas and inspiration for front porch designs. Decks.com: A free to use Deck Designer plus several ready to use plans. TimberTech: Large database of free to use deck plans. Trex: Great deck planning tools. Great Videos: on how to build a deck, framing a roof on a porch, and tips for building porches and decks. I’m considering an 8×12 popout for our singlewide. What company do you suggest in the Long Beach/South Bay area of California?